The British Irish Rights Watch has won the first ever Parliamentary Assembly of the Council of Europe (PACE) Human Rights Prize. the organisation’s “courageous and outstanding work in monitoring and bringing to light human rights abuses, and its fight against impunity in Northern Ireland”. It also commended the NGO’s “vigilance” in ensuring that measures taken to combat terrorism were in confomity with international human rights standards. British Irish Rights Watch – which takes no position on the eventual constitutional outcome of the conflict and works with all sides of the community – researches alleged human rights violations, provides consultancy services to lawyers, organises expert testimony and sends independent observers to trials, inquests and inquiries. Much of its work is carried out by volunteers. Congratulations to the NGO - and let's hope that the peace process in Northern Ireland continues without violence as we have seen lately, full of embarrassment! On the EU Calendar I saw that "trademark fees" are on the agenda on Tuesday, 31 March 2009. "The European Commission will again reduce the fees payable to the EU agency responsible for granting EU-wide trademark rights, OHIM (Office for the Harmonization in the Internal Market, located in Alicante, Spain), making access to trade mark protection around 40% cheaper for businesses operating in the EU single market. A Community trade mark currently costs between €1,600-€1,750, but this new reduction would convert the separate application and registration fees into a new combined fee costing between €900 and €1,050." Commissioner McCreevy is organising a press conference tomorrow at 11:30, together with the responsible agency, the Office of Harmonization for the Internal Market (OHIM). Does anybody know how these fees are in comparison with the rates in third countries? Nanne and DoDo are drafting a response to the EU Consultation on Energy Networks on the European Tribune platform. Their draft is open for comments (and all necessary background documents are linked), so join the debate and contribute to an open discussion on the future of European energy networks! Poland in the EU, a blog of the Polish journalist Dominika Pszczółkowska started in January, remarks several interesting Polish candidates for the 2009 EP elections. and a Polish expat who will run for the French Greens in Belgium. What do you think about the socialist leaders who support Mr Barroso, like the British Prime Minister Brown or the Spanish, Mr Zapatero? I speak in the name of the PES. Not in the name of national governments. One thing is sure: the PES will not support Mr Barroso. He is the candidate of the European People's Party (EPP). He will never represent the opinions of the socialist family, even though some social-democratic governments are supporting him, for national reasons. The last word will be for the [European] Parliament after the elections. Sounds like a little conflict in the PES family! Update (30 March): EUobserver has taken up the story. Last week, British MEP Daniel Hannan ruled the world. Almost. It is a pity that it has to be a speech from a British politician speaking to another British politician about basically British politics has to become one of the most viewed and famous speeches in the European Parliament ever (and for two days the most watched video worldwide). The EP webeditors have discussed the viral effects of this phenomenon, but even Mr Hannan, a well-known blogger himself (which is one basic explanation for this success), seemed to be surprised. So Mr Hannan has finally won: He managed to nationalise the European Parliament. Hanne Dahl, a Danish MEP from the eurosceptic party JuniBevægelsen (Independence/Democracy Group) has brought her 3 month old baby to the EP session last week. According to press reports, Dahl did not intend to make a political statement but needed to take her child because her husband could not be in Brussels that day. Yet, she - and her party - are now using the international attention that the picture has brought to them to make a case for MEPs who want to go on parental leave. So far, this is not possible - MEPs have the choice to leave the European Parliament or simply remain on duty and letting their children with a partner. Can it be that a eurosceptic deputy brings some positive attention to the European Parliament...?! In what ways do you see ICT and broadband promoting growth and competitiveness, especially in order to emerge from the economic crisis? What steps are you taking to encourage the take-up of broadband in your country? What are the aims of national strategies for broadband that you have launched or that are in preparation? In what form should the European policy for information society and the media (post-i2010) incorporate the fight against the crisis and the potential of the ICT? When you read the paper and then find these questions, you have the feeling that is written by a first year university student who is having an internship in the Council and was allowed to write three pages because the desk officer needed to drink a coffee. If this is what our ministers have to care about during a Council meeting, then maybe they should just join the desk officer on a coffee! In the USA, on of the first proven cases of election fraud through voting machines has been documented. This is a very relevant finding, since many European countries are using those machines or are discussing their usage. The example above shows that fraud through those devices is actually possible, and quite easy if you get someone into the system who is helping to execute the fraud. I'd like to remind that quite recently the German Constitutional Court banned a certain type of voting machines, in particular because they were not in line with transparency standards. What is happening with the "Th!nk about it!" blogging competition? Is TH!NK ABOUT IT! dying? For whatever reason, little of that [general blogosphere dynamics; JF] seems to be happening on TH!NK ABOUT IT. Few posts seem to attract many comments and there is very little animated debate. I fully agree, and I should add that the topics posted recently did not really attract my attention, after a very lively and interesting starting period. It looked like most bloggers had the energy for 1-2 good and interesting posts, but got lost afterwards. This is kind of a pity, because this project seemed to be bringing good dynamics in the EU blogosphere. What I hope now is just that some of those who discovered blogging through this project - or were discovered as bloggers through the attention it got - will continue to contribute to the debates outside the "competition". Open Europe recently stressed that Barroso earns more than Obama and will receive pensions and other payments right after leaving the Commission that will reach about one million Euros. The story has been taken over by EUobserver. [...] les salaires qui s’élèvent à environ 236.000€ par an par commissaire, 296.000€ pour le président Barroso. Soit plus que le président américain Barack Obama (400.000$, soit 293.000€). Pas mal pour un super secrétaire représentant même pas élu au suffrage universel ! Very good remarks, indeed, given the recent salary bashing. Especially the comparison of a directly elected president and a quasi-secretary (although slightly polemic) is very pertinent to me. In fact, we are paying a lot of money to somebody who is doing a bad job (and might be re-elected because of this) - and we cannot do anything about it! The Czech EU-Council Presidency (14): Collapse!!!! The Czech government yesterday lost a vote of no confidence by 101 of 200 votes. This means, more or less, that the EU presidency collapses. What a mess: In times of crisis, a new EU member state loses its government and the EU its de lege leadership, although de facto I didn't see much in the last months. "This is not the first time that a country in charge of the rotating EU presidency has a change of government during its mandate. In 1996, Italy faced a similar situation when a centre-left coalition headed by Romano Prodi won parliamentary elections, ousting the centre-right government led by Lamerto Dini. In 1993, Denmark also faced a change of government while it was chairing the EU, with the government led by Poul Schluter falling and Social Democrat Poul Nyrup Rasmussen coming to power." But I this is maybe the worst timing one could imagine, in a time when efficient leadership is needed, and the European Parliament elections are coming closer every day. I don't have doubt in the capacities of the Czech diplomats and administrators on all levels, they will be able to keep up the working rhythm which dominates most activities during a presidency, but if they lack clear guidance and leadership, then important decisions might be delayed, cancelled or at least weakened. In addition, this will give more power to the already too powerful EU Council secretariat, which will use the opportunity of a weak presidency to push through its own agenda. All in all, an extremely bad day for the European Union! Read also on this topic: Jon Worth, Coulisses de Bruxelles, EurActiv, Dr. Sean, European Union Law, Toni Straka. The EP elections are coming closer and closer, but I still don't really have the feeling that there is a real campaign going on, even less than 2 1/2 month before the big event. Some little discussions here, some small campaign activities there, electoral lists are getting finalised, materials prepared. But I don't feel a real debate about the issues - not to speak about the persons, the latter being roughly quieted thanks to more or less tacit agreement on Barroso as coming EU Commission president. I suppose that things might get a bit more visible, more lively in the near future, but I am still kind of disappointed that besides some increasing online activity of some candidates there is not much politics happening, especially not on the European level. 400 Million people, one of the largest democratic electorates on the planet, are asked to vote for what shall be the next European Parliament. No matter how uninfluencial, how ignored, how self-referential, how provincial this institution and its competence are: It remains still one of the largest democratic institution in the world. Just that nobody seems to care - including, most astonishingly, the political actors involved. Imagine there are European elections, and no one wants to discuss European issues...! Thank you, Cédric, the never satisfied European! PS. : Even the EP webeditors liked it. You want to know how much the EU trust its international partners like third states or international organisations? Then have a look at the list that informs about the security levels of documents accessible for external partners. Public Affairs 2.0 is listing those MEPs that - according to their knowledge - are using Twitter. "Martin Schulz, chairman of the Socialist group in the European Parliament, has called the Czech EU Council presidency a "total washout". The Prague business paper Hospodářské noviny can only agree: "It seems it's too much to ask of the Czech presidency that it participate in discussion on the crisis. [...]"
Proof of its unimportance: In the International Harald Tribune report on the outcomes of the EU summit, there is just a short line mentioning the Czech presidency while focussing on Barroso and given similar space to Germany and Poland. Doesn't sound as if there has been much leadership from the Presidency. You know that one of my favourite topics for this blog are the European Parliament elections. But for the next three weekends, my eyes will be on the three South-eastern "M"s: Macedonia, Montenegro, Moldova. This weekend, there will be presidential elections in Macedonia (22 March; see also A Fistful of Euros), next weekend we will see early parliamentary elections in Montenegro (29 March), and in the third week we'll get parliamentary elections in Moldova (5 April), which in the latter case also means presidential elections because the Moldovan president is elected by the parliament. Beside the fact that all these elections are crucial for the further democratic development of these three European countries, the almost parallel elections put a lot of political weight and logistical pressure on OSCE/ODIHR and other international organisations like the Council of Europe, which have to co-ordinate three election observation missions at the same time. All interim reports regarding the three elections are published on the ODIHR homepage, and I can only recommend reading them. When it comes to me, I will now start to enjoy my last weekend in this country, meet friends, enjoy life, and don't care (much) about politics and administration, international organisations, and whatever else kept me busy all these weeks. Have a nice weekend - and see you next week, everyone! EPP backs Barroso, and PES won't oppose: A sad day for the EU! EPP leaders have backed Barroso to remain EU Commission President after the 2009 elections. And Jean explains why the Socialists - the PES - won't oppose Barroso, either. What a sad day for the European Union! A citizens' summary by the European Commission: "EU policy paper - simpler farm policy"
Maybe I just haven't found something like this before, but for me it just felt like the citizen-friendly future has arrived at the European Commission. "I am confident that we can meet our target of reducing the administrative burden arising from the CAP by 25 percent by 2012. But we are not resting on our laurels. There are many more projects in the pipelines. One of these is an IT system that can improve the information flow between Brussels and the Member States. You may wonder what that has to do with simplification. The answer is simple: we firmly believe that better IT systems could reduce the administrative burden on farms by more than €400 million." Since in the same post Ms Boel promised that the respective report would be easy to read, I went to see it (PDF document). And in this summary, everything important is summarised in a limited number of clear sentences without standard EU vocabulary. Fully understandable for every citizens who can read. And everyone interested in more details can still read the full communication, which - I have to admit - is also very readable and keeps things as simple as possible. That is exactly the way I want to see EU administration to act: Keep it clear and simple. This is a good day for the EU Commission. PS. : And because of this nice presentation of the report, I don't even feel obliged to look through all details hoping to find something evil hidden between the lines. "I thought Europe was a country?!" The European University Institute in Florence is developing a tool that is supposed to help EU citizens to position themselves on the European political map. EU Profiler, which should be active from 23 April, looks like a very promising tool for all those who would like to know more about the positions of the European parties as well as their own position vis-à-vis the European parties - and do not want to read all the manifestos (like I did with the PES and ELDR manifestos, the EPP manifesto or the UEL manifesto). Euronews last month published a 8 minutes long reportage on EU Profiler, and its worth watching. We'll have to see how this tool looks when it is finally functional, but I suppose that it will go beyond anything that has been produced for any previous EP election. According to a EurActiv article citing a Romanian think tank, 9 out of 35 elected Romanian MEPs have already stepped down from their mandate - an important figure taking into account that the MEPs from Romania have only been elected in 2007. It is also high in comparison with Bulgarian MEPs of whom non has resigned so far. Via the European Union Law blog I found that the EU ombudsman - whose website Jon and me have criticised some time ago - has introduced an interactive guide for lodging complaints to the ombudsman. That is a very helpful tool, leading you step by step towards the complaint to be placed with the ombudsman - or towards the right institutions to which your issue should be addressed. The European Ombudsman should be able to help you. The "Could he help you?" section of the Ombudsman's website provides more information on how to make a complaint. A complaint form is available if you wish to make a complaint. If you reach another result, the tool tells you why this is the case or where the complaint should be directed in order to be dealt with properly. That is the kind of online support that I would like to see more from all EU institutions - very easy, very effective, and very good! "Did the EP go web crazy?" To make it short: The answer to their own question is yes. [T]he EP is paying €18 million for this campaign, which the EP’s Communication staff says is a bargain at €0.05 per eligible voter. I object those calculations because it would mean that all eligible voters would and could be reached. And if you calculated the price for every actual vote that is triggered by such a campaign - which means: How many people who would not have voted without a campaign have been voting because of the campaign - then the cost per vote would be much higher. So the figures presented are nothing but PR trying to imply that voter education and awareness raising is cheap - which it isn't! That doesn't mean I am against the campaign - I am very much in favour - but I just don't like those kind of PR calculations. Rural development policy 2007–2013 shows many options for investing in ICT in agriculture, agri-food and forestry, and in the rural economy in general. MSs and regions need to efficiently target funding and capital in order to achieve the best outcomes. In order to meet the needs of the rural population in a comprehensive manner and to ensure that EU funding can have a significant impact, managing authorities of different EU programs will need to co-operate closely and complement each other activities applying a strategic approach for rural areas' development. In the context of this document this sounds for me like agricultural funds (e.g. the European Agricultural Fund for Rural Development (EAFRD)) are supposed to be used to connect rural areas with high-speed internet connection. Although there might be some very basic logic in these considerations, this is the most intransparent way in promoting ICT development. The EU institutions occupy 1.9 million square metres in Brussels. The Commission and its executive agencies occupy more than half: 919,000 sq m of office space, spread over 55 different buildings, plus nearly 80,000 sq m of conference space, crèches and childcare and other support buildings. In "former" times, old or worn-out national politicians became Members of the European Parliament to end their political career in a well-paid but invisible environment. Far away from their capitals - in order not to interfere with national politics anymore - they could live in tranquility and enjoy the luxury of inconsequential politcs. But times are changing. Following the example of a young MEP who became Finnish foreign minister, more politicians seem to find their way back into national politics. And this time, it goes high up: EPP-ED deputy Valdis Dombrovskis (ED member) has been elected new prime minister of Latvia, as Anita Kalmane reports on Th!nk about it!, informing that Liene Liepina (who already was short-time MEP in 2004) will be his short-term successor in Brussels and Strasbourg. Dombrovskis has quite a tough job coming up seeing the effects of the crisis in Latvia, and let's wait whether his experience in the EP was of help to get his work done. After the Party of European Socialists (PES) (see here), now the European Green Party (EGP) is starting to target bloggers, inviting three of them - fully financed - to the EGP congress in Brussels at the end of this month. Yet, I think this goes one step to far. It's true that most bloggers are writing for their own pleasure, for their narcism, for their idealism, for their [insert your own interpretations] and might not possess the funds to visit a party congress in Brussels. But financing bloggers (as financing journalists) sounds more like buying a service than asking for a critical coverage of political activities. I am not sure that I like that. have signed and published a joint declaration asking for a proper electoral EP campaign. EUROPE: GIVE YOUR IDEAS A FACE! The European Youth Forum, the Party-Political Youth Organisations and the Young European Federalists ask for a truly European debate during the EP Elections Campaign in order to allow the citizens to choose their candidates to key positions in the EU. As young Europeans, sharing a vision of Europe based on the values of democracy, peace, human rights, solidarity, freedom and sustainable development, we recognise the success of European integration, but we stress that we can successfully face future challenges only if the EU will be able to speak and to act as a real political Union. In the pursuit of a more transparent Europe, the European Youth Forum (YFJ) the Party-Political Youth Organisations - Youth of the European People’s Party (YEPP), Young European Socialists (ECOSY), European Liberal Youth (LYMEC), Federation of Young European Greens (FYEG), Democrat Youth Community of Europe (DEMYC), European Free Alliance Youth (EFAy) and the Young European Federalists (JEF) hope that in due time before June 2009 the citizens should know names and faces of the candidates to the main political positions of the European institutions. In particular the composition of the Commission should reflect the results of the elections as indicated by the Lisbon Treaty which has to be ratified as soon as possible. The European Parliamentary Elections, the renewal of the Commission and the subsequent legislative period present a unique opportunity in which the European citizens have a direct say on the policy development within the EU. Therefore it is important to make the elections a truly European affair, addressing issues that concern all EU citizens and not 27 Member States particular interests. Hence, we believe politicising and personalising the EU policy-making is a natural step forward in European integration and the best way of guaranteeing a cross-border debate on issues affecting our lives and of getting young people and all citizens interested in voting at EP elections. In parallel, we also need to inform them in more simple words about the role of EU institutions: their complexity is indeed difficult to grasp for most citizens. Too many European citizens don’t go to vote because they cannot put faces to European politics. Our generation is not afraid to bring the EU closer to its citizens and expects brave decisions from our national and European leaders and institutions; moreover, we want concrete benefits from the EU in our everyday life. It’s time for a democratic election of the European leaders and institutions! There is only one thing to add: I am glad that all these organisations found the will and words for this joint declaration! With interest I note that the British conservatives - rather eurosceptic - leave the European People's Party's (EPP) group (EPP-ED) in the European Parliament which itself is rather pro-EU. The rumour that this might happen one day was floating around for quite some time already, but it seems as if the British conservatives want to go into the election campaign with this new face, maybe also to fight clearly eurosceptic players like Libertas which has just started its UK campaign. Altogether, this is a considerable blow to the EPP-ED and will cost the group in the European Parliament over 25 seats if the Tories will at least keep their result of 2004. Whether the Tories will join the eurosceptic United for a Europe of Nations (UEN) or whether they will form a new political group is not yet clear. Read the story and related discussions also here, here, here, here, here, here and here. Radovana Jágriková reports on Th!ink about it! that the first time that she heard about the EP elections in Slovakia was in connection with the tragic death of a 22-years old MEP candidate. The full story and the summary of discussions in Slovakia you can find here. For an overview over the Slovak candidates and parties running in the EP elections, see also the article by EurActiv. In an interesting argumentation (Romanian), Dan Luca points out that among the around 5,000 lobby and interest groups in Brussels, non is headed by a Romanian, in particular because of the status of new member state and the lack of industrial structures in Romania. Nevertheless, Luca highlights that these European leaders are quite influential (and well-paid), and that attention should also be given to these posts and not only to top EU institution positions if Romania wants to have influence on the European scale. [T]he Political Monitoring Group [...] is composed of members from both the CoR and the EESC and its remit is to oversee the workings of the cooperation agreement between the two Committees, particularly with regard to the so-called Joint Services (notably translation and logistics), where the two Committees have decided to realise considerable economies of scale by pooling their resources in a joint structure. They can raise attention to little details - such as a Political Monitoring Group supervising a joint agreement between the EESC and the CoR - which have an impact on the daily work of EU institutions but which rarely find the daylight of public or scientific attention. Therefore: Thanks, Martin, for blogging! In the country currently holding the Presidency of the Council of the European Union - the Czech Republic - the EU Parliament campaign starts to develop. Internal rather than pan-European issues are largely expected to dominate debates during the pre-election period. The opposition CSSD [PES member] is widely expected to win the elections and will consider the ballot successful if it gains eight to ten of the 22 seats reserved for Czech MEPs. Sounds like everything is clear in advance?! I wonder whether the Council Presidency will not give a bonus to the governmental parties, especially if they will be able to create positive images in connection with certain EU-related events. The battle for seats in Brussels will mostly be fought on the Internet. The Civic Democrats [ODS], in particular, announced their intention to use social media, in a similar manner to US President Barack Obama [...] [And] CSSD was the first to launch a so-called "permanent campaign" aimed at keeping in touch with people at all times by means of "mini-campaigns". Such mini-campaigns include online advertising, special websites and so on. Sounds like these elections will be the first Europe-wide elections where many parties, national and European, have decided to test the usage of internet and especially social media. My interpretation of these developments (despite the Obama hype): National parties until now do not have much to lose (taking into account the second-order image of the EP elections), so this campaign is the perfect opportunity to try everything and adapt it for the next "important" elections. It is very interesting to see these developments in the Czech Republic, in particular because of the interconnection with the EU Council Presidency. C'est intéressant de voir que même en Belgique, le pays qui "héberge" la plupart des institutions de l'Union européenne, la population et les parties politiques ne se concentrent que sur les élections régionales et à peine aux élections européennes. Comment intéresser ceux qui sont loin de Bruxelles quand même ceux qui sont proche ne suivent pas avec intérêt...?! I wanted to comment directly, but I need a registration and I cannot register everywhere, so I publish it here on my blog. The original article discusses low interest in Belgium for the upcoming EP elections, especially compared to the parallel regional elections, and I wanted to express my concern that if those living in the country hosting the most important European institutions do not feel interested in the European elections - how can we expect somebody living further away to care for what is going on in Brussels? In this blog, I am following up national and European activities on the path to the European Parliament elections 2009. German MEP on EP secretariat members: "Apparatchiks"
German liberal MEP Silvana Koch-Mehrin commented in her "blog" ('Eurofighter') on last week's visit of Hillary Clinton (widely discussed in the EU blogosphere), complimenting the multicultural and gender-balanced message sent out by the composition of the participants. I was sitting in the second row of the fully occupied hall, directly behind the Chief-Apparatchiks from the General Secretariat of the EP who occupied the first row. There were only men. Sounds like Ms Koch-Mehrin has a high opinion of her administration. It's Friday, lunch time. I usually don't eat, that makes me tired. Prefer blogging or researching for blog posts during that time. One of my favourite feeds is the one for the latest public documents of the Council. That is where I usually get the documents from, when I write about Council agendas, working parties, and other weird topics. That's where you find things that will appear on the public scene only weeks or months later. And this is what a European blog can and should deliver: Discuss European issues from a European perspective, one that is not already turned around in the mainstream media. It can dig up topics that creep below the surface, below the crucial attention line even of those who care more for European issues than others. Sometimes it is just enough to translate information from one language into English to support a wider dissemination of interesting facts (like this one which got quite a lot of attention). And you can be assured that I will continue in this direction. In three weeks, I will leave my present job and this country to return to science. In fact, (international) governmental work is very interesting, because you get to hear and do things that are out of reach of the scientist, the political activist, the NGO guy, the citizen (that's all me). You understand the connections between different parts of the political system, national and international, you learn to distinguish the important from the less relevant. You have access to information and discussions that never find the surface, not even if a blogger is digging hard through public feeds. But you are not (or hardly) the one to put things on the agenda, especially on your own. That is why I don't continue for the moment, but return to the life of a scientist, a blogging scientist obviously. Still, the last weeks before leaving will be intensive and interesting, the present tasks demand full attention. But everything is already arranged for the time that comes afterwards. I think I will spend some time in and around Berlin from April, so anyone interested in meeting me there (e.g. those passing by the re:publica'09) is most welcome contact me. And I am also eager to contact and meet some of you who are writing and blogging about Europe and the European Union. This weekend, you won't hear from me anymore. I have meetings after lunch today, and tomorrow I'll use the last opportunity to go to a neighbouring country that I only know from transit to visit a large European city I haven't been to yet. So have a nice weekend, wherever you are reading these lines - see you next week(s)! Romanian foreign minister: "A better political class"
Democracy can create a new political class, and the society can elect it, according to democratic rules. Every Romanian politician, the president in particular, following his/her mandate, has the duty to improve the political class. In this regard, I would rather speak of a better political class instead of a new one. It would be nice if this was be the goal of all politicians - to make the political class better - but I am afraid that this is quite optimistic (or ignorant) taking a look at the political classes in many European countries. Remark: The last time he was interviewed by a German newspaper, Mr Diaconescu urged the EU to continue the enlargement process. French Prime Minister Fillon to become EU Commission President? Okay, I support the Anyone but Barroso! 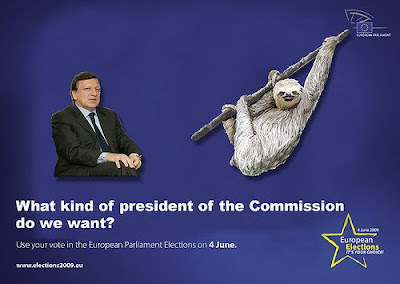 campaign, but this thing is also not called "Anyone like Barroso!". Rumours that somebody like the colourless François Fillon could become candidate for the EU Commission Presidency are making me afraid that instead of Barroso we just get a clone. Fillon, from a Brussels perspective, has many qualities: He is a jurist, discrete, free of the arrogance that is generally associated to French people, married to a British, and he is considered to be an excellent professional. His is able to absorb the Sarkozyan tempers while keeping his good-will and he is showing that he is able to lead a complex administration such as the Commission's. In other terms: He would be somebody who could work silently with the member states' representatives in the Council without disturbing them. He keeps a low public profile because he is rather an administrator than a politician. He could continue the bad work of Mr Barroso while selling the notion of "change". I am afraid. And concerned for the political future of the Union. I hope it's just rumours! How to recruit and how much to pay for Civilian ESDP missions? Proposals to reduce the ERASMUS time are stupid. ERASMUS figures do not decline because of the length of the stays but because home universities too often put too many administrative and educational restrictions on those who want to leave. If leaving 5-6 month means to repeat one whole year of studies, this is a serious negative incentive not to go. Stays of less then 5 month are too short to connect to the country and culture where the ERASMUS students are going. Building relations to other Europeans - local and international - needs time, especially if these relations should contribute to a European identity, in my eyes one of the main reasons to organise ERASMUS exchanges. So don't shorten ERASMUS, but ease the exchanges by better inter-university co-ordination and good-will on the side of university administrators! 5. The cooperation at a cross-border level can be enhanced further by the establishment of Cross-Border Stability Groups to focus on the issues relating to potential problems in specific firms, markets or infrastructures that are significant for all members of the group. [T]he establishment of "Cross-Border Stability Groups" among relevant Member States is important for ensuring effective cooperative arrangements among authorities, both in the short and longer term. Does this mean that in one year nothing has happened? If this is such an important element that it was among the 11 lines of the MoU of 2008, why is there nothing but one sentence in a 14 page document of 2009? I know that this just a minor issue, but its one of these many issues that take years and years, keep diplomats, administrators and ministers discussing but which in fact never develop. Waste of time. Political deliberation for the sake of political deliberation. Lack of follow-up, lack of speed, lack of consistency. I haven't heard about this initiative, so let's have a short look at it. The Office will support Member States in their efforts to implement a more consistent and fairer asylum policy, for example by helping to identify good practices, organising training at European level and improving access to accurate information on countries of origin. It will also be responsible for coordinating support teams made up of national experts that will be deployed at the request of Member States faced with a mass influx of asylum seekers into their territory. It will also provide scientific and technical assistance for the development of asylum policy and legislation. The Office will be yet another agency, and is supposed to start work from 2010. Quite an optimistic timeframe, though, taking into account the upcoming parliamentary elections. Over the first four years (2010-2013) it will cost 40 Million Euro, starting with about 5 Million in 2010 and reaching 15 Million in 2013. Other concerned actors have already reacted: UNHCR spokesperson Ron Redmond expressed his organisation's approval of the initiative, which is not unimportant since the new agency will need to co-ordinate its work with the UNHCR. Un européen jamais content ('A never satisfied European') has published the newly unveiled Swedish EU-Council Presidency logo. When the Swedish take over the Presidency in July, this logo will replace the ugly logo of the Czech Presidency. "Sober, nice, efficient, just like an IKEA logo." Update (04 March): Two comments to this article point to the similarities with the Pepsi and Sony Ericson logos - and Jon Worth has produced a metamorphosis picture from Sony Ericson to the Swedish logo - while a backlink brings us to a post that shows resemblance of the Swedish logo to Obama's campaign logo. The German Constitutional Court ('Bundesverfassungsgericht') has just decided (German source) that the voting machines used for the German parliamentary elections of 2005 were not in line with democratic standards, especially the publicity of the counting. This means that for the 2009 elections - European Parliament in June and Bundestag (the German parliament) in September - voting machines cannot be used. Alpha.Sources: "The glass is half empty for CEE countries and the EU after the latest summit"
In an amazingly well-written post, Alpha.Sources discusses the outcomes of the EU summit on the economic crisis last weekend. Claus focusses on the situation in Central and Eastern Europe (CEE) - thus the eastern EU countries, a category that has recently been discussed in this blog and beyond. I cannot help but feel that pointing towards heterogeneity amongst the CEE is rather like pointing towards heterogeneity in the context of critical patients on an intensive ward. Surely, one patient may be closer to the brink than another but common to all of them is that they are in pretty bad shape. Ultimately, a much more systemic perspective is needed here and we need to realize that a case by case approach does not work. This does not mean that the CE economies are not different; it merely means that the EU and the Eurozone need to see this as an integral part of the fight to keep the economic edifice from crumbling entirely. But read the complete post to understand how he gets to that point! Via La Oreja de Europa ('The Ear of Europe') I just learned that the major Spanish newspaper El Mundo ('The World') features the European Union and the European Parliament elections with a special subsection of its website. All major (and minor) newspapers in European countries should follow this example! "[L]'Europe manque désespérément de leadership politique, d'incarnation et de force de réflexion commune, rôle que ne joue pas suffisamment la Commission. Les institutions de Lisbonne sont donc plus nécessaires que jamais sans être suffisantes." "There is a lack of political leadership in Europe, a lack of substance, of joint reflection, something the Commission does not fulfil sufficiently. More than ever, the Lisbon [Treaty] institutions are needed, without being sufficient." I think that is exactly the point: The European Commission does not fulfil its role as 'engine' of the integration - of a joint European reflection - anymore. Without proper leadership, the Commission's role will vanish - and already today member states in the Council and the European Parliament start to dominate the debates, regrettably with too much weight on the Council's side. Well, the Mediterranean is a rather warm area, known for its good weather and healthy southern culture. But after the Israeli-Palestinian conflict, the always controversial Union for the Mediterranean has been deep-frozen, as Le Monde reports. It seems that especially the northern African countries in that "Union" (which did never look like a Union) do not want to sit on the same table with Israel, and I suppose that many of the EU countries which have never been really in favour of this political "monster" will not be sad about these developments. In the end, this is another setback for Napoléon Nicolas Sarkozy whose baby this Union has been during the French EU-Council Presidency. The Coulisses de Bruxelles have noticed that Napoléon Nicolas Sarkozy for the first time refused to explicitly support EU Commission President Barroso for a second term, postponing a decision after a possible second Irish referendum (in English: European Voice). Is Mr S. now joining the "Anyone but Barroso!" crew? Supplement: In fact, the low visibility of the European elections is not just a particular issue in Latvia. Last week, a friend of mine and I talked about elections, and I was saying that the next main elections I am focussing on are the European Parliament elections. When I told her that they will be in June she just asked: What, in June!? Why don't you hear about this? I advised her to check at the embassy or back home how the procedure for distant voting will be. I'll have to do the same myself, since I don't know yet where I want to spend the election day(s). According to EUobserver, MEPs from Fianna Fail, the Irish ruling party, will change their affiliation from United for Europe of the Nations to the liberal ALDE group after the European Parliament elections - a move which I would interpret as quite pro-European (pro-EU). Read also: nwyth's appraisal of Fianna Fail's move. And Jon Worth's argument that Fianna Fail would better fit into the EPP-ED group, but can't because the main Irish opposition party is already part of this group. Leopolis has produced an excellent metamorphosis picture: President Medvedev of Russia is Nicholas II of Russia. The only question left to us is: Will Medvedev end as Nicholas II ended?